"The work of Art seems to be something thrown off - a by-product of the process of being and working. Art just happens, like falling in love…"
Scottish painter, jewellery designer and jazz musician. The first young British abstractionist to win international reputation after World War II. 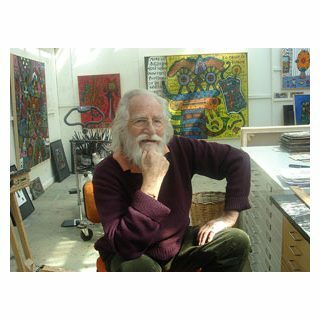 James Alan Davie, born Sept 28, 1920 in Grangemouth, Scotland as son of a painter and etcher. He studied at the Edinburgh College of Art from 1937 to 1940. While in the army in WW2, he concentrated on his other artistic talents as poet and jazz musician(alto- and tenorsax, piano); member of the Tommy Sampson Orchestra, touring in England. After the war he travelled extensively in Europe, and in Venice he was introduced to the work of American abstract painters like Pollock, Motherwell and Rothko (Collection Peggy Guggenheim). Returning to London in 1949, he made a living as jewellery designer (Vivian Leigh´s jewellery in the film ´Antonius and Cleopatra´) and worked as jazzmusician. His first one-man-exhibition took place at Gimpel Fils in London 1950. Since the mid 50´s more than a hundred one-man-shows in all leading galleries of Europe and the US. By the 1960´s, Davie had works in various important collections including the Museum of Modern Art, New York, the Contemporary Art Society, England, and many more (see listing below). First encounter and collaboration in 1973 with Tony Oxley, the European pioneer of Improvised Music experimenting with amplified drumset (1969). Public performances at Gimpel Fils gallery, Tate Gallery, Maison de Culture, followed. Duo-concerts in 1974 with Tony Oxley at Harlow College, St. Martin´s Art College, Hitchin College, Gimpel Hanover, Zurich, recordings for Swiss broadcast DRS. First release of these recordings on Vinyl in 1975, re-released in 2003 on Berlin-based label a/l/l. "The work of Art seems to be something thrown off - a by-product of the process of being and working. Art just happens, like falling in love… I feel very close to the alchemists of old; and, like them, I have in the end reached some enlightenment in the realization that my work entails a kind of symbolic self-involvement in the very processes of life itself. And having thought about it, I am able to come to some definite conclusions as to the essentially paradoxical and enigmatic nature of art and living" (Alan Davie, 1958). "He developed his own painting philosophy, and in the 1950´s, his introduction to Zen Buddhism led him to understand the artist as a figure that embodies both ´the intuitive creator and the intellectual spectator´. 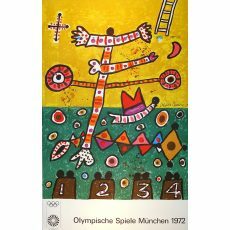 His success in the visual arts continued while he developed his musical career in the 1970´s, and his work continues to have a wide appeal today."